A proposed audit of the San Diego Police Department should be wide-ranging and could take 18 months to complete, interim Mayor Todd Gloria said Thursday. Police Chief William Lansdowne said Saturday he wanted an audit of his agency in the wake of new allegations of sexual impropriety by two officers. 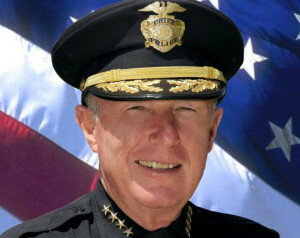 San Diego Police Chief William M. Lansdowne. Official photo. Christopher Hays, 30, pleaded not guilty on Tuesday to a pair of felony false imprisonment counts and three misdemeanor sexual battery allegations. Hays, who has resigned, faces up to three years and eight months in prison if convicted. A woman came forward last week to claim that a San Diego police officer groped her and exposed himself after arresting her on suspicion of auto theft about a year ago, Lansdowne said. She at first thought the alleged perpetrator was Hays after seeing a photo of him on a news report, but a subsequent investigation revealed that it was a different officer. The San Diego Police Officers Association identified the accused lawman as six-year department member Donald Moncrief, 39, a South Bay patrol officer. He has been placed on paid leave pending the outcome of the investigation. At his weekly media briefing, Gloria said the proposed audit will go to the City Council for authorization. Council members will want to evaluate the various options and costs before selecting an auditor, he said. Gloria, who will be succeeded by Mayor-elect Kevin Faulconer on March 3, reiterated that the SDPD has more than 1,700 “dedicated, hard-working men and women who care deeply about our city,” and only a few bad apples. Gloria said he wants the officers to know he stands behind them as long as they follow the law. He said he strongly supports Lansdowne as chief. The audit will show if the actions of the two police officers demonstrates a “systemic” problem in the SDPD, which suffers from chronic under-staffing, Gloria said. The recent allegations come a couple of years after another officer, Anthony Arevalos, was convicted of demanding sexual favors from female drunken driving suspects he pulled over in the Gaslamp Quarter. Arevalos is now behind bars, and the city has been coughing up hundreds of thousands of dollars to his victims to settle civil lawsuits. Lansdowne announced a policy change Wednesday that will require two officers to take women to jail.